Lionel Francis Vaughan was born in 1888 at Newport, Monmouthshire, Wales. He was the son of William Francis Vaughan (b1856) and Ethel Elizabeth née Mead. William, known as Frank, was a railway clerk who eventually became the Stationmaster at Yeovil Town Station. Lionel emigrated to Rhodesia, although the date of his emigration is unknown. In the early stages of the Great War it appears that Lionel enlisted and served in the Veterinary Corps of the South African Army. On mobilisation in South Africa the total animal establishment numbered 8,000, which figure increased rapidly until, at the peak, there were some 160,000 animals in service. Immediately after the outbreak of war a Director of Veterinary Services, with four Assistant Directors, was appointed and a Base Veterinary Depot, where the enlistment and training of personnel commenced, was established at Johannesburg. It was during this initial stage that the establishment reached 47 officers, 450 NCOs and men and 750 Bantu. The ability and zeal of the personnel of the new service was such that within two months no fewer than eight Base Veterinary Hospitals and 15 Mobile Veterinary Sections were drafted for service to German South West Africa. In 1915, German South-West Africa (today's Namibia) was invaded by South African and British forces of the Western Allies, including Lionel, under General Louis Botha, the first Prime Minister of the Union of South Africa. Marching seventeen miles a day, his columns occupied most of the country, all of its ports, and the diamond mines which had made it the Kaiser’s most profitable colony. In 1916 Lionel was sent to German East Africa under General Smuts. Smuts had a large army (for the area), some 13,000 South Africans including Boers, British, and Rhodesians and 7,000 Indian and African troops in a ration strength of 73,300 men. Despite all these troops from different allies, it was essentially a South African operation of the British Empire under Smuts' control. In 1916, while Lionel was in German East Africa, the War Office approached the Union Defence Force of South Africa of the urgent need for a unit of expert marksmen to operate on the front line on the Western Front. Sir Abe Bailey recruited and carefully selected men for the unit from Northern and Southern Rhodesia and the Union of South Africa. Bailey financed the equipping of this force throughout the war and paid the salaries of the men involved. The South African Sharpshooters were also known as Bailey's Sharpshooters. An excellent marksman, Lionel passed the very stringent selection to become a member of the illustrious South African Sharpshooters. With other members of the unit he returned to England aboard the RMS Saxon, departing from Cape Town and arriving in Plymouth on 11 May 1916. The South African Sharpshooters joined the 1st Battalion of the Northamptonshire Regiment on the Western Front. They were a very small unit that had, at it maximum strength, 24 members. After the Somme this reduced by three killed in action. Later one man was captured, another was missing in action and two were transferred out to East Africa. Even so they had a phenomenal record of enemy kills. Lionel fought as a sniper in the Battle of Albert (1–13 July 1916). The battle comprised the first two weeks of Anglo-French offensive operations in the Battle of the Somme. In this opening phase the assault broke into, and gradually moved beyond, the first of the German defensive systems. For the British, the attack on 1 July proved to be the worst day in the nation’s military history in terms of casualties sustained. Following this, Lionel fought in The Battle of Bazentin Ridge (14–17 July 1916) which was also part of the Battle of the Somme. Almost immediately afterwards he took part in the Battle of Pozières Ridge (23 July - 3 September 1916). This battle represented an attempt to exert renewed pressure on the strategically important central uplands, notably around the vital positions of Thiepval and Pozières. Lionel was killed in this battle on 17 August 1916. He was aged 27. In its edition of 1 September 1916, the Western Gazette reported "Lionel Vaughan, aged 27, the eldest son of Mr WF Vaughan, GWR stationmaster, Yeovil, was killed in France on the Somme Front. He has many friends in Bridport and Yeovil, where he is well-known. He served with general Botha through the campaign and eventual conquering of German South West Africa in the Veterinary Corps. When this German Colony was vanquished he proceeded to German East Africa under General Smuts, where he was selected with sixteen others, to go to France as a sniper, he being a particularly fine shot. With others they formed the S.A. Sharpshooters Section, and were attached to the Northamptonshire Regiment, 2nd Brigade. After spending a few days home in Yeovil recently, he was ordered to the Front, where he has remained under the command of Lieut. Methliven, who has written a deeply sympathetic letter to the bereaved parents expressing the regret of his comrades and bearing tribute to his gentlemanly conduct and bravery in the field. It should be mentioned that the deceased gave up a good appointment in Rhodesia to fight for King and country. His younger brother is now serving in the West Somerset Yeomanry. (The bereaved parents wish, through the 'Western Gazette' to thank their friends for the many expressions of regret and sympathy which have reached them.)" 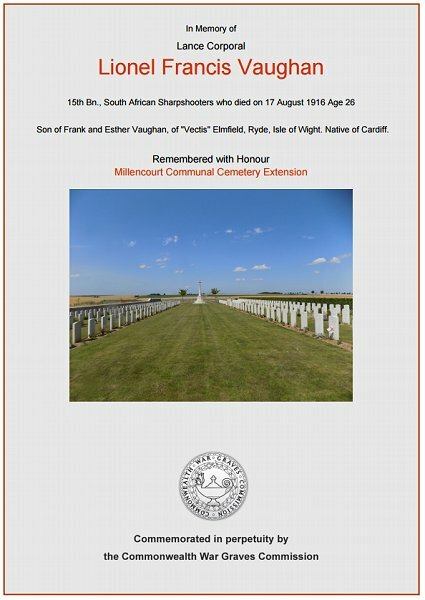 Lionel Vaughan was interred in Millencourt Communal Cemetery Extension. Grave A.41, and his name is recorded on the War Memorial in the Borough - albeit simply as Vaughan, L rather than the more correct Vaughan, LF. The Commonwealth War Graves Commission certificate in memory of Lionel Vaughan.